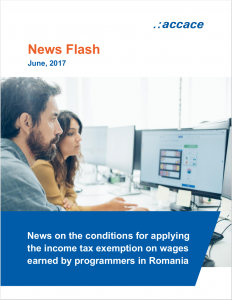 In the Official Gazette dated 22.06.2017 has been published the Order 409/4.020/737/703 which regulates the legislation regarding the framing of the activities in the category of computer program creation activities in order to grant the income tax exemption to the programmers. This order brings a much-anticipated change to IT companies, eliminating the provisions regarding selling a final product or a component of a final product. Thus, the new order only stipulates that companies must effectively carry out computer program creation activities that correspond to eligible occupations. Another change concerns the reintroduction of the minimum income threshold. The threshold is set at EUR 10,000 for each employee benefiting from the income tax exemption. The minimum income threshold does not apply to companies set up during the tax year and for the following fiscal year. This order will come into force on July 1st, 2017 and will be applied starting with the July 2017 income, thus repealing the old Order no.872/5.932/2.284/2.903/2016 of 09.01.2017. Do you need help? Tell us how we can help!